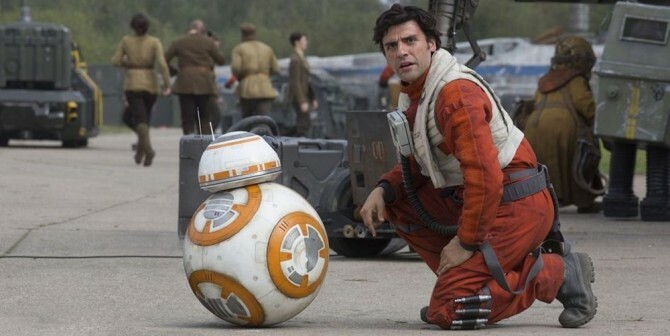 Oscar Isaac Holds Up Star Wars: Episode VIII As The "Dark Second Chapter"
When the credits rolled on Star Wars: The Force Awakens, and John Williams’ unmistakable score blared through the speakers, it was clear that J.J. Abrams had teed up the beginning of a journey – one to be told across three mainline Episodes. With Rogue One primed to spin off from Disney’s core arc later this year, it is Rian Johnson (Brick, Looper) that will steering fans back to the future with the release of Star Wars: Episode VIII in 2017, and it looks as though testing times lie ahead for Rey, Finn, Poe and the rest of the heroes (BB-8 included). That’s according to Oscar Isaac, who spoke to Rolling Stone magazine in anticipation of the imminent X-Men: Apocalypse. Unsurprisingly, talk soon turned to the stars, where Isaac held up Episode VIII as the “dark second chapter” of Disney and Lucasfilm’s rebooted juggernaut. What happens now is the heroes get tested. All three of them get tested immensely. BB-8’s doing all right. BB-8 gets tested too! Everybody gets tested! It’s the dark second chapter, but not really dark. Much of those trials and tribulations will likely stem from the arrival of Benicio Del Toro’s villain, not to mention Supreme Leader Snoke, Hux, Phasma and Kylo Ren who, according to a leaked scene description from yesterday, is set to unleash that signature rage in epic fashion. Star Wars: Episode VIII is pegged to arrive on December 15, 2017. Before that, Gareth Edwards will be whisking fans back along the series timeline to introduce an Empire approaching the peak of its power in Rogue One: A Star Wars Story. It opens on December 16, 2016.